Many female celebrities marry for money, but these three actresses chose love first. Eliza Sam (岑麗香), Tavia Yeung (楊怡), and Ali Lee (李佳芯) chose partners with less successful careers than theirs. By defeating traditional notions and expectations that women need to marry or date men who are richer, more powerful and intelligent than them to be considered as a good match, these women are nevertheless secure and happy in their relationships. 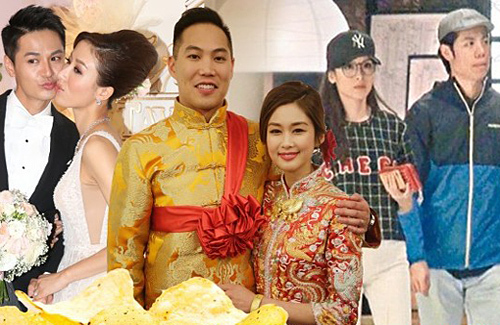 While working for TVB, Eliza was extremely busy with filming dramas, so she was not unable to spend Valentine’s Day and celebrate her first year of dating anniversary with Canadian-Chinese boyfriend, Joshua Ngo. To commemorate their special day, Joshua sent two bags of specialty chips from Canada as their anniversary present. Known for her good-nature and frugality, Eliza was satisfied with the efforts Joshua made, rather than the actual present itself. After all, sincerity is the most important instead of the cost of the gift. The couple got married in 2016 and Joshua moved to Hong Kong to accommodate Eliza’s acting career. Ali is currently heavily promoted by TVB. Earning significant praises for her performance in Who Wants a Baby <BB来了>, Ali is one of the strong contenders for this year’s Best Actress at the TVB Anniversary Awards. Although often mistaken to be married because of her fantastic portrayal of a wife and a new mother in the drama, Ali is unmarried, but is currently in a long-term relationship with ViuTV Host, Danny Chan (陳炳銓). The couple is living together and speculated to have marriage plans soon. Ali does not mind that he is less popular than her, as they are often photographed on simple dates and activities such as exercising and walking their dogs together. However, marrying someone rich does not ALWAYS mean that’s it’s only about money. Poor rich people… doesn’t ANYONE love them because of their personality?! Surely there are some really decent ones who just happen to be rich as well. marrying rich doesn’t equate to happiness. know somebody who married a rich man. basically, she just told her husband it’s okay as long as he goes home. for what i know, not too long after they had a son, her husband had a fight with a close friend over another girl. all the friends know that the husband is a big flirt and has multiple lovers. That’s very true, but divorces are mostly over money. Don’t forget about Myolie too isn’t she’s more popular than her husband? And Grace isn’t she’s more rich than Kevin? What about Cindy Au? Roger Kwok wife? I don’t think Roger is that rich when they got married. Danny Chan doesn’t looks full Chinese he looks mix with either Thai, Indonesia, Philippine or Cambodia?